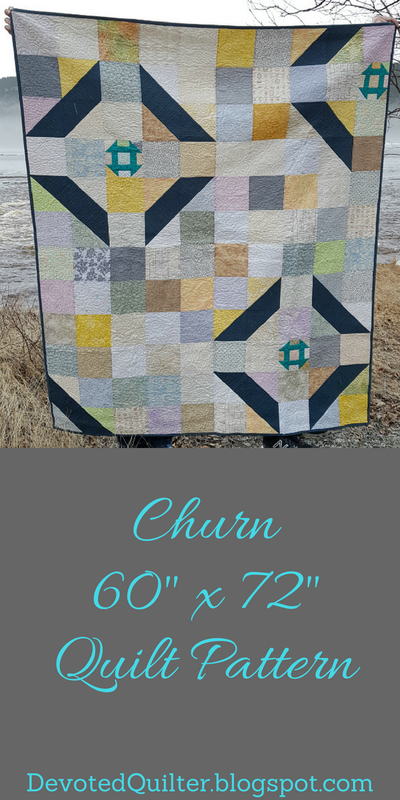 I love getting to release one of my patterns 😊 Today I'm releasing my Churn pattern, which was originally published in the 2018 Quilter's Planner. The pattern is now available through both my Payhip and Etsy shops and, to celebrate the release, it is available for 25% off until May 25th. Churn finishes at 60" x 70", which is my favourite throw size, perfect for curling up with a good book or stretching out for a nap. Churn uses the traditional churn dash block in a fun modern setting. The simple patchwork background stitches up quickly, but adds lots of visual interest. As a bonus, it's a great way to use favourite prints from your stash. In fact, the whole quilt is a great scrappy stash buster. Get your copy of Churn today! As always, if you make Churn, I'd love to see your version, so be sure to tag me (@devotedquilter on IG or @devotedquilterdesigns on FB) or email me a picture or link to a blog post (devotedquilter at gmail dot com). Congratulations on another great pattern release Leanne! Congratulations on releasing your pattern. I loved it the minute I saw it in the planner. Bravo, for a beautiful pattern!